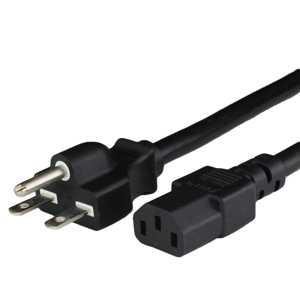 NEMA 6-15 Power Supply Cords are available with IEC 60320 C-13, IEC 60320 C-15, IEC 60320 C-19, NEMA 6-15R (STRAIGHT), and other connectors (receptacles). Standard STOCK jacket type is BLACK SJT(OW) but rubber cordage is available. Other jacket colors (white, gray, blue, green, red, yellow, orange) are available. We stock several standard lengths. NEMA 6-15P Plugs are used for 3 wire (hot-hot-ground) grounded devices not exceeding 250VAC and 20A. Depending on your electrical service, you may read either 208VAC or 240VAC phase to phase. This may affect your power draw and required amperage for wiring your equipment. Refer to your team or your equipment specifications sheet to determine the best electrical cord to fit your needs. Just as the NEMA 5-15P (plug) can fit in the 5-20R (receptacle), so can the 6-15P with the 6-20R. The NEMA 6-15P to Open/Whip/Pig Tail- NACC is a power supply cord rated for 250VAC and 15A max with 14AWG. NACC, North American Color Code, refers to the color code of the conductor insulation which is BLACK / WHITE / GREEN. This cord is for field installation to equipment or device that requires a line, line and ground conductor (not exceeding the rated power of the cord) to operate. Standard Whips are Remove Outer Jacket(ROJ) 2" and then each conductor is stripped 1/4" to bare conductor. Other ROJ/Strip combinations are available for bulk quantities upon request. For two pole cords like this, "X" pole is generally black and "Y" pole is white, with green as the ground conductor. The NEMA 6-15R is a 3 wire grounded connector rated up to 250V and 15A. The 6-15R will only connect with the 6-15P and is used mainly for our NEMA 6-15 Extension Cord Series where it is used to extend a power source off usually a wall receptacle to a certain location for convenience.